DID YOU KNOW THAT 50% OF ALL FEMALES AND MALES EXPERIENCE HAIR THINNING? If we’re talking confidence, or how we feel about ourselves, thick, lustrous hair is right up there with smooth, even skin. Particularly for women, great looking hair gives us that underlying confidence that makes us our happy, life-loving selves. But the truth is, a surprisingly large number of men and women’s hair falls short of this ideal. 50%* of people are affected by thinning hair that lacks thickness and fullness. Nioxin has the answer. 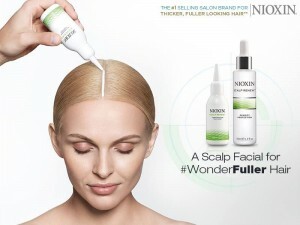 Proven to help improve scalp health, NIOXIN is the ultimate solution for a healthier, thicker fuller look to your hair. Peter Mark in City Square Shopping Centre is hosting a complimentary two day Nioxin Clinic on Thursday the 14th and Friday the 15th of April. No appointment necessary, drop in to receive your personal consultation and solution to your individual hair thinning & styling needs. Enjoy fantastic offers from Peter Mark on the range for a limited time only. For any queries on the upcoming clinic please contact Peter Mark Waterford SC on (051) 853 460. Start your journey to confidence with Peter Mark and Nioxin. *Global hair consumer segmentation study. No: WW06D030.